After encountering the cube probe Spock Tells Sulu to sound the Alert, and Sulu does. Meanwhile, Kirk is in Sickbay getting a physical. At one point Kirk gets angry at McCoy for not telling him about the Red Alert. What? Why? Didn’t Kirk hear Sulu’s message over the ship’s intercom? 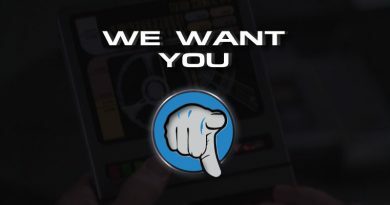 Wouldn’t sickbay have received this message from the bridge as well? After all, during a red alert wouldn’t sickbay need to prepare for causalities? Communications, in general, are a problem in this episode. Multiple times Kirk responds to comm whistles. 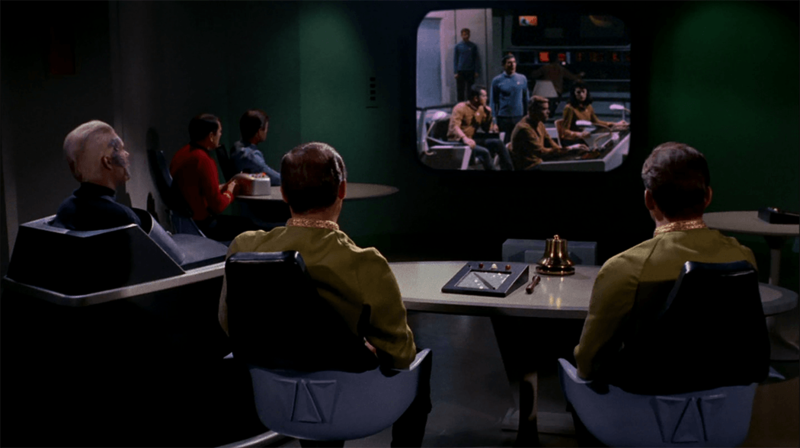 While in his quarters Kirk hears the whistle, responds, sits back and then moments later there is another whistle and Kirk doesn’t respond and rightfully so, the message wasn’t for him, but the question is, how does he know when the communications are for him? Spock uses a strange simile when giving his opinion on the probe cube, he says it might be like fly paper. Do they really still use fly paper in the 23rd century? Would a Half Vulcan raised on the planet Vulcan really know what flypaper is? Watch Spock while he’s on the bridge. In one scene Spock wears an earpiece in his ear, but then when we get a close-up, suddenly the earpiece is gone. 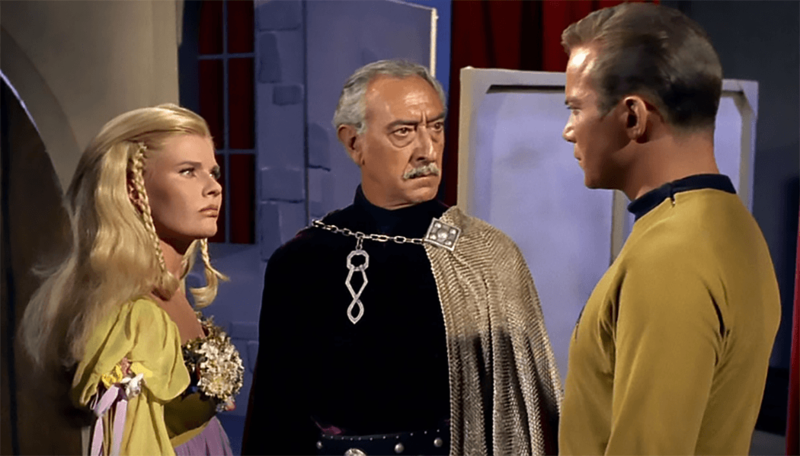 At the end of the episode, Kirk is suspicious of the drinks Balok is giving the landing party. To allay his fears Balok pours himself a glass and takes a sip. The problem is that this shouldn’t allay Kirks fear at all… First off because the drinks were already preprepared before arriving on the tray, and second, the substance may not be harmful to Balok’s species, but that doesn’t mean that it isn’t toxic to humans. Why didn’t he just have it scanned? Spock must pluck his eyebrows, in the Cage scenes, they are very very bushy! Why does Starbase 11 have hinged doors? Isn’t this a Starfleet Facility? Shouldn’t they have sliding doors like EVERY other Starfleet facility we’ve ever seen? Time sure flies when you’re at Starbase 11. When Kirk Beams down, it’s daytime, they go see Captain Pike and it’s Still day, but suddenly the next seen in Mendez’s office, it’s night time. So just how fast does Day turn in to Night at Starbase 11? In one scene Mendez shows Kirk a highly classified report on Talos 4. It’s so classified that Kirk even questions Mendez showing it to him, to which Mendez replies that he’s reporting that he authorized Kirk to see it. If it’s that classified, why is Mrs Piper standing in the room? Shouldn’t she have left? When Pike is kidnapped, miss Piper screams, then the commodore responds to a communication. The problem here is, there is never a comm whistle for the Commodore to respond to. The computer aboard the Enterprise must enjoy a great drama production. When Kirk and Mendez find out that they can’t regain control of the ship, the computer makes sure to zoom out so Spock can see a reaction shot of Mendez. Why does everyone at the hearing wear a dress uniform except for Scotty? After Mendez is given command of the Enterprise, Hanson calls from the bridge saying Bridge to Commander. Bridge to Commander? Isn’t Mendez’s rank commodore? Now I know it could be said that Hanson was referring to the Commodores’ current position as commander of the enterprise. However, if he was, shouldn’t it have been Bridge to Captain? Also when Decker assumes command of the Enterprise in the Doomsday Machine, no one seems to have a problem calling him Commodore. 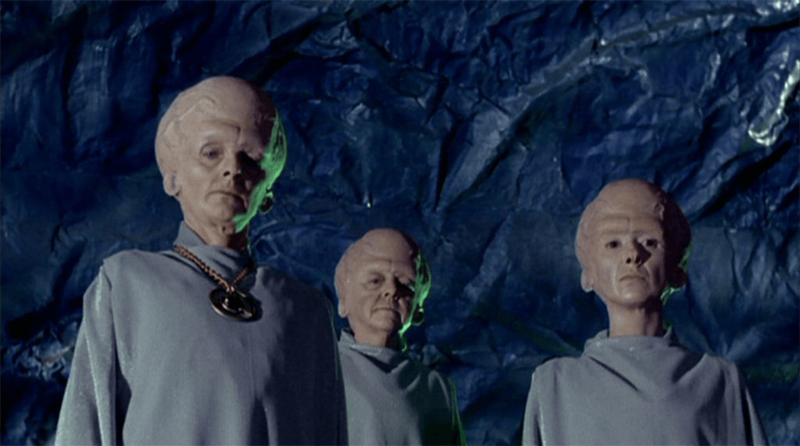 I guess the Talosians really don’t know anything about technology. it’s been almost a decade later and they STILL haven’t fixed the elevator door that the Enterprise landing party destroyed! There are a LOT of problems with numbers in this episode. First, off the stardate given by the computer for events that had happened before Kudos the Executioner disappeared is stardate 2794.7. Supposedly these events happened over 20 years prior to this episode. Why then have we had stardates that chronologically appear before that date? 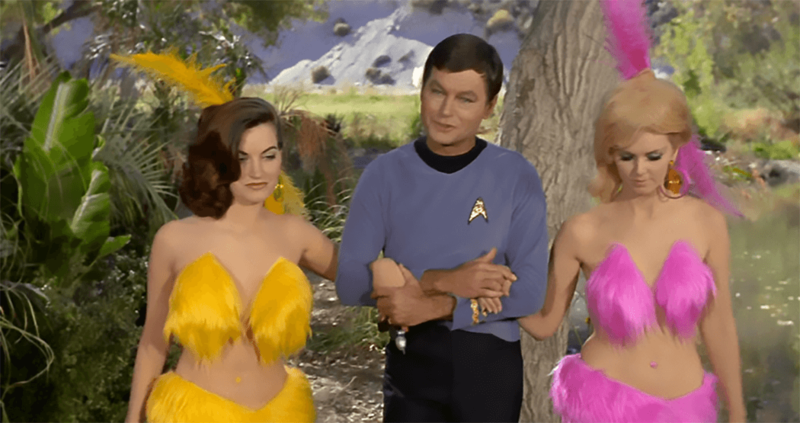 During those stardates, Kirk is in the command of the enterprise and he certainly wasn’t a preteen at that time. Second Are they really only 9 witnesses to Kudos? He killed 4000 colonists, half the population. Yet only 9 people have seen him? At first, I thought that they were referring to witnesses of the tragedy itself, but not, they make it clear that it was for identification purposes. This makes no sense, Kudos is a governor or Mayor of this colony and no one ever sees him? Really why would they need witnesses at all? there’s got to be DNA or fingerprints doesn’t there? And Third, when Kirk is making inquiries to the computer, it confidently replies that there were 9 witnesses. However, this main computer, the heart of the Enterprise fails to tell Kirk that 7 of them were now dead, so effectively there were only actually 2 witnesses. And we know the computer knows that the 7 were now dead, as Spock uses the computer and is able to tell Kirk that piece of information himself. 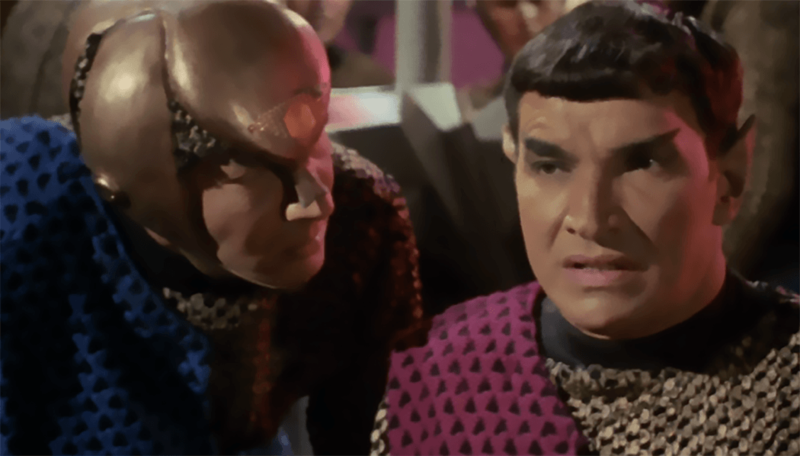 How exactly did Spock figure out that Kirk was stuck on the Events of Tarsis 4? When he makes inquiries himself to the computer he asks the computer to report on what events that the 4 people have in con man. The problem is, he includes Anton Karidian in that list. Anton Karidian didn’t exist at the time of the Executions. Why Is Riley the only one on duty in Engineering? I get that the Enterprise has day and night, that makes sense. But are we really to believe that an active duty area like Engineering, first of all, has it’s lights turned down low and second that there isn’t an entire duty shift working in Engineering? Why does the Map on the view screen list Romulus’s sister planet as Rom 2? I thought that Planet’s name was Remus? When outpost 4 is under attack the Kirk orders the outpost to transmit its visuals of the enemy vessel. Outpost 4 does, but then after outpost 4 is destroyed, the Enterprise continues to receive pictures of that enemy vessel, shouldn’t the transmission have been cut? 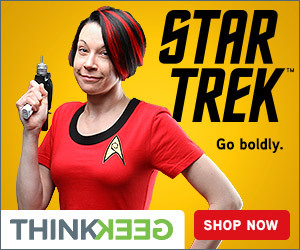 The Enterprise must be poorly designed. Without receiving a single hit, the Phasers burn out and stop working. Why? I get that there might have been a malfunction, things like that happen, however, should a ship like the Enterprise have back up systems to prevent situations like that? Though not a mistake, for some reason in this same briefing room scene, Kirk hands Spock a book. It’s just odd really. I mean why was it there in the briefing room to begin with? And if it was there to look up information on the Romulans before the meeting took place, what happened to the library computers? Shouldn’t they have all the information anyone needs? The Romulan’s Plasma weapon itself deserves a little scrutiny. 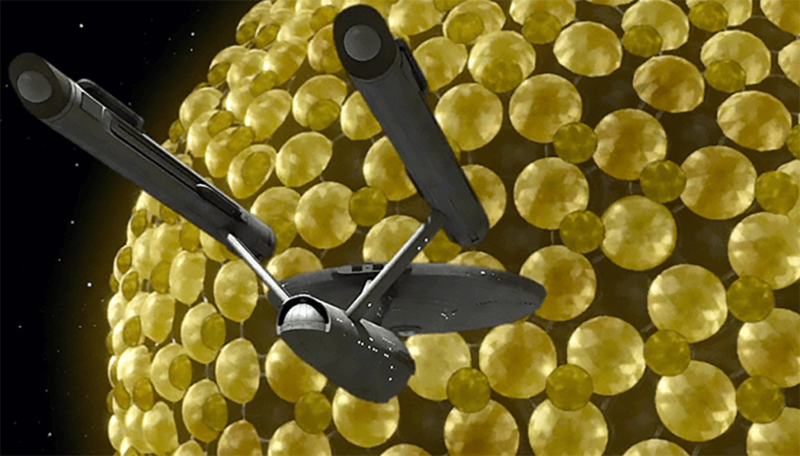 After all, to me it appears as a cloud of energy, so why didn’t the Enterprise simple move left or right out of its way? Why is the crew whispering during the silent running parts of the episode? 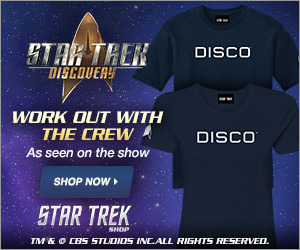 Doesn’t Kirk and the crew know that sound doesn’t travel through space? Angela Martine, sure got over Tomlinson fast didn’t she? In the last episode Balance of Terror, the finance she was going to marry dies, but in this episode, she’s chummy with Rodriguez. Watching this episode you’ll note that the gun Sulu finds fires 7 bullets, the unfortunate part is that that type of gun can only hold 6 bullets. When looking at the rabbit tracks, the imprints left behind by the white rabbit are side by side, like as though the rabbit was hopping. However in the scene whether McCoy encounters the rabbit, he’s clearly walking, so shouldn’t the imprints be staggered? Uniforms in this episode are an amazing thing. First, after Kirk gets hit in the groin, his shirt rips open. And Second, when Don Juan attacks the Yeoman, he rips her tunic on her right side, yet when she puts it back on, miraculously, her tunic has been repaired. When the Enterprise is about to lose all contact with the Landing Party Spock beams down to the surface. Sulu immediately exclaims that someone is beaming down from the bridge. Sulu, people don’t beam down from the bridge. They either beam down from the ship or the transporter room. Speaking about stranding the landing party this is another episode where the shuttlecraft could have come in handy. Yet no one mentions it why? When encountering the Tiger Kirk is frightened. I don’t know why, if you look closely you can clearly see the tigers is chained up. When the caretaker of the planet first appears, look at the tree trunk, you can clearly see the shadow of the boom mic used to record the sound for the episode. Also, the caretaker must not like Spock very much. When he goes through listing everyone’s names, he includes their ranks, all except Spock that is, he simply calls him Mister and not Commander. Thank you for watching today’s episode. If I’ve missed something feels free to leave a comment below and don’t forget to like and subscribe. Thanks again for watching, live long and prosper.